Custom wall mural inspiration can come from an infinite amount of sources. 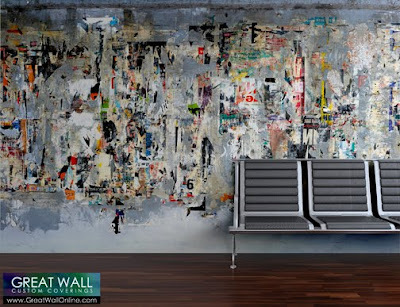 Today's custom wallpaper post examines unexpected urban art, in other words, finding beauty in the ordered chaos of modern city living. The mural in our inspiration room is an image of the remains of countless handbills and posters that have been adhered over a wall. Over time, the layering created by the numerous advertisements has created a very textural look. On top of that, the strips created by remains of ripped paper give the image a wonderful abstract quality. You may have passed by a similar scene and never thought that it could be a wallcovering, but that's exactly what we do, and the type of image we love to see produced as a custom wall mural. Contact us for more idea designs and ways to use your own digital photograph as your very own wall mural.